What’s getting in the way of filling your schedule with great clients? Home Articles What’s Getting In The Way Of Filling Your Schedule With Great Clients? 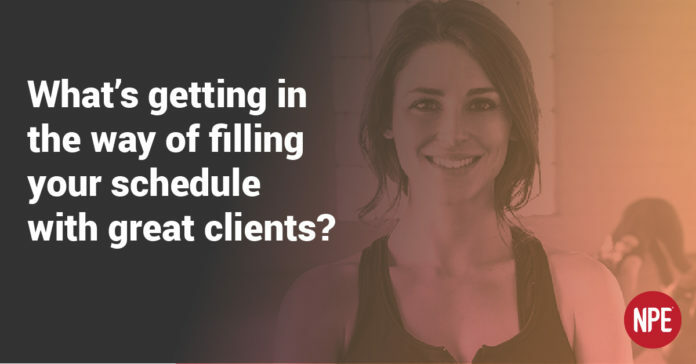 Some fitness business owners fill their schedules with great clients. Their calendar is filled with people who follow the program that gets them results, people who are fun to be around, people who refer others, and people who pay on time. Other fitness business owners don’t have all that. Their calendar has a lot of gaps. They have some clients they like, but they also have others that don’t seem right for their business. These clients always ask for a discount. They are inconsistent in their efforts. And they can even be distracting and toxic to you and your facility. The fitness business owners who fill their schedule with great clients make an intentional choice to do so. They decide what kinds of clients they are going to serve. Then they target that group with their sales and marketing efforts. The fitness business owners who struggle react to whomever comes along. They need the money, they are afraid to turn down new clients, and they feel they don’t have choices. But guess what? 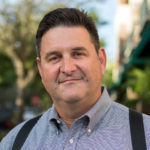 Those who choose their clients … actually get more clients! That’s because they have a target to shoot for, and having a target makes their marketing efforts much more clear. If you don’t choose your clients, you’ll end up with whoever or whatever. That’s a slow road to nowhere. But the fast-track to filling your schedule involves the hard choice of deciding which clients are best for your business, and which are not. We’ve helped 36,000 fitness business owners over 11 years, and we’ve coached many entrepreneurs who started out as independent personal trainers without any clients. We’ve watched them not only fill their schedules, but grow their business beyond what they thought possible. And a crucial step was identifying their “dream” clients and going hard after them. Quick fixes. “I just need 1, 2 … 5 clients right now.” Yes, you do, and this is a crucial first step in getting them. Limiting thoughts. “I can’t be picky” or “Maybe later I can choose, but not now” are the most common. Replace every “can’t” with “won’t” to clarify your thinking. Yes, you can choose, because one of the first steps we take with clients is to have them get clear on the best clients for their business. Stress over money. The problem is money will continue to be a problem until you create a strategy to target the right clients. The stress gets reduced once you’ve got your schedule filled with the best clients. Don’t put off deciding who your ideal clients are. You don’t need a half-filled schedule with whoever. You want to go hard to build the business you want, and fill your schedule with great clients.